You are here: Home / In Luxembourg / Go Gaelic in Luxembourg! Gaelic Sports Club Luxembourg is proud to announce that the first round of the Benelux Gaelic Football Tournament will be hosted in Luxembourg, in Junglinster on Saturday, 28 March 2015. 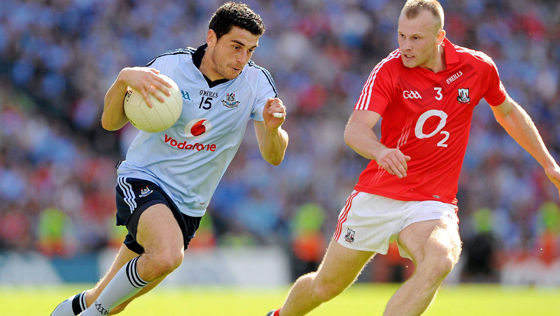 The sports of Gaelic Football and Hurling are very popular in Ireland, but these traditional exciting team sports have spread beyond Ireland and are now played all over the world. More than 70 clubs in mainland Europe gather together in different cities to compete in tournaments during the European Gaelic Games season. Luxembourg’s Gaelic Football tournament is the longest-established Gaelic Games tournament on the mainland of Europe. Since 1995 teams have come to the Grand-Duchy to compete for the Black Stuff Cup, a beautiful replica of the Sam Maguire Cup that is awarded to the All-Ireland football champions, commissioned by Phil and Cathy McKenna of the Black Stuff from a Craftsman in Ireland. There will be mens and ladies teams from Belgium, France, Germany and of course home teams from Luxembourg. All spectators are welcome, the tournament starts at 09:00 and runs for the entire day. This is a great day out for diehard supporters of Gaelic Games or for anyone who has an interest or is just curious to find out more about the sport of Gaelic Football. The stadium in Junglinster can be accessed on the 107, 110, 111 and 120 bus routes and has plenty of free parking. Entrance is free and as well as this fast-flowing sport, spectators will enjoy traditional Irish music and entertainment along with a bar and grill with Irish food and drinks. This is an ideal day out for the entire family. The tournament will finish with the prize ceremony and a party in the Black Stuff from 20:00 – all are welcome, fáilte Roimh Chách!